This extra lightweight, Daylight clip-on lamp is a great companion for crafting or reading. 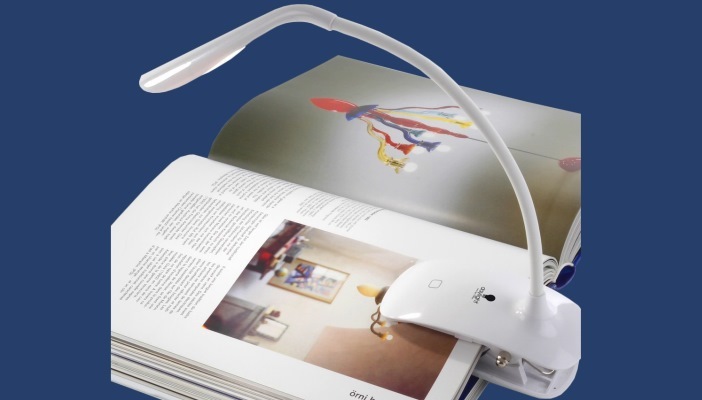 It can easily clip onto a book, needlework frame, table or laptop with the light on the flexible arm easily directed where needed. The dimmable daylight LEDs provide high contrast and accurate colour matching, making it easier and less tiring to read, work and see detail clearly. Energy saving: All daylight bulbs and tubes use 80 per cent less energy and last ten times longer than standard bulbs. To find out more or to buy the Daylight clip-on lamp, shop online.